← Field Notes: Piennoli at Meadow’s Mirth! For most of the summer, I was looking forward to tasting one of the most prolific tomato vines in my garden: Grappoli d’Inverno. About a month ago the first ones turned red and the tasting began. I was a little disappointed with the results and only gave it a solid “meh,” and then they started ripening in droves — way too many to keep up with. As luck would have it, Deb Kam posted a timely article on the Seacoast Eat Local blog reminding me about roasted tomatoes … ah yes, roasting. And this, in my opinion, is where the Grappoli really began to shine; they are off the hook delicious. And now that I’ve been clued into the idea of winter storage and how to hang them — I’m frankly a little over the moon for these little buggers. The very idea of plucking a sweet little tomato from the basement in January makes winter in southern Maine seem not so bad. Note: The tomatoes in my post for Seacoast Eat Local on slow roasting them are a mix of Principe Borghese and Grappoli from Meadow’s Mirth. Though not part of the grow-out, the small yellow blush plum tomatoes are from New Roots Farm, and are also great for drying and slow roasting. 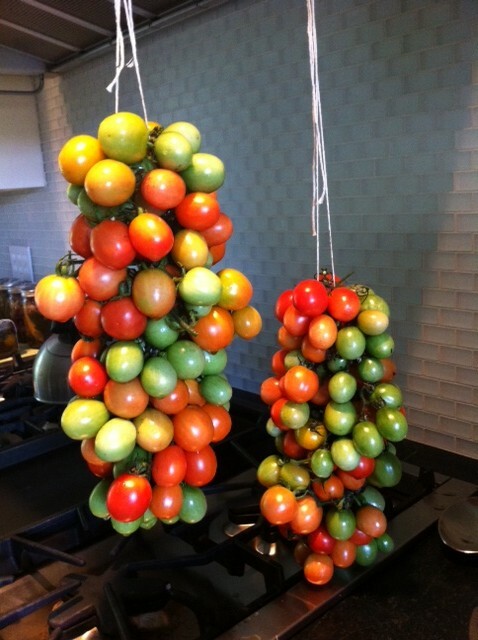 This entry was posted in field notes, tomatoes / pomodorini and tagged pomodorini, tomatoes. Bookmark the permalink.